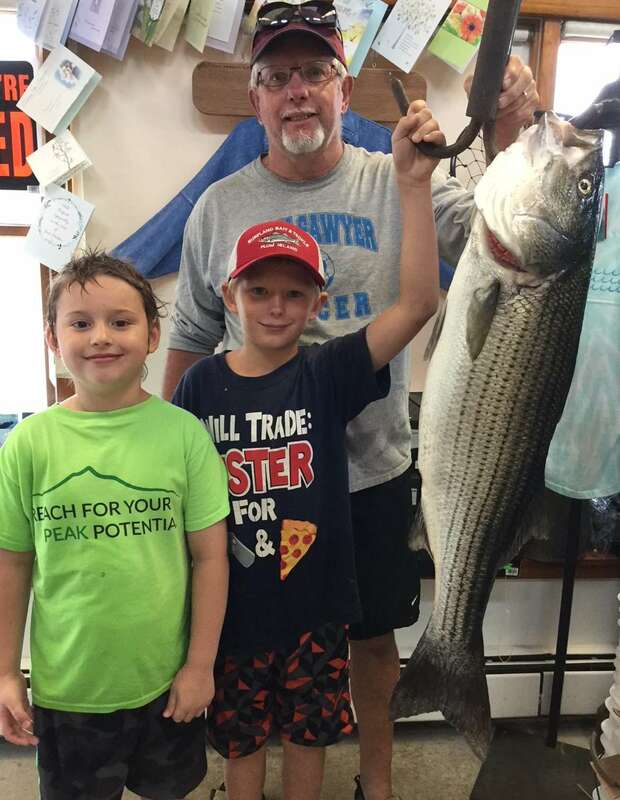 Surfland Bait and Tackle – Plum Island Fishing » A Break in the Summer Doldrums? A Break in the Summer Doldrums? Well it was certainly a slow end to the month as far as fishing went. With things this slow there just hasn’t been anything to write about…..plus I was away. Sorry. Well I’m back now and it seems that with the opening of the southern lots in the refuge the fishing has picked up some. Not where we would want it to be, but there are a few decent fish around with more schoolies and from the rumors flying around there is also a white shark. Hmmmm, wetsuit fishermen be careful! Like James here who sent us this picture & caption on Friday. Is that a fin in the background James??? This past Wednesday we had a beautiful 17 pounder come in that was caught off the beach down at Sandy Point. 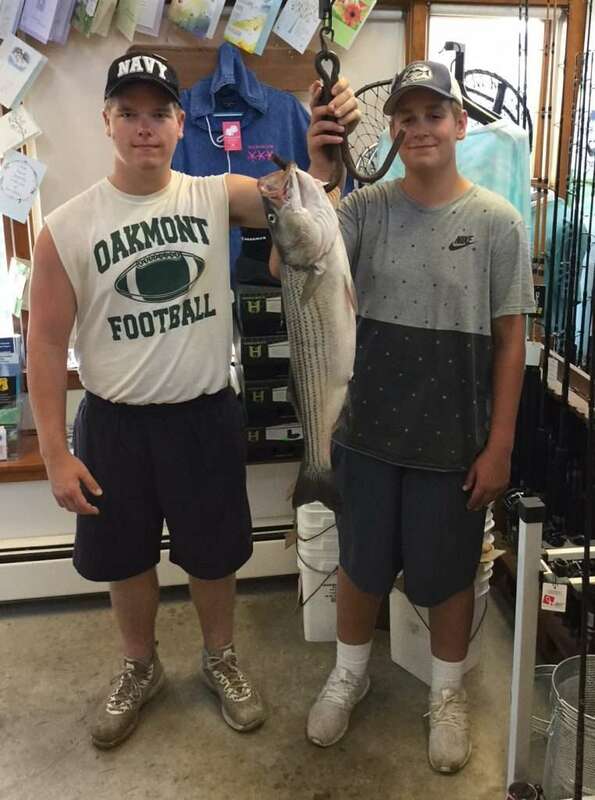 Greg Ardine from Danbury NH was using clams when he hooked into this fish. 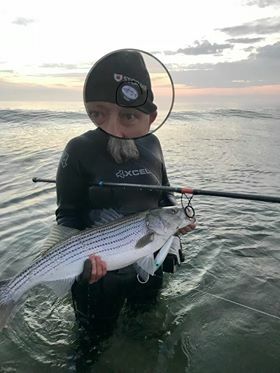 Guess the fish was sick of pogies and wanted something different to eat. Also landed down at Sandy Point was a small schoolie by Greg’s son, Dominick (red hat). Dominick also hooked into a bigger fish but lost it before he got to see it. Dominick was hoping for his first keeper……….next time!!! And then just late this afternoon, Kurt Karkane from Westminster, Ma came in with the Ledger boys, Adam & Noah who are from Gardner, Ma. They came earlier inthe day to the shop , picked up some worms and went to lot 6 to fish down the PRWR. Just after low tide at 3:00 Kurt hooked into this 33″ fish that weighed in at 11.9 pounds. They also got about another half dozen fish but they were all undersized. To All you critics on keeping legal and large size fish just close your eyes and shut up like you do at the supper markets you do eat meat & fish from the store don’t you unless your a veggie person thats Fine if you are. I hunt deer / pheasent & fish for food not just for the sport of it but knowing how it was takin . Its better knowing how my food was cared for and processed for the table.